This is a means of communication. No words, no great creativity. But I got some new toys and wanted to share the joy of something new. Oh, and to figure out what this doodle might be communicating. For several weeks, I have been playing with Zentangle. I began with the very basic tools: ultra fine black Micron pen, a 2B pencil, a sketchbook, and some 3.5″ square art tiles (a pack of white and one of black), and a book (One Zentangle a Day, by Beckah Krahula). It wasn’t like I needed yet one more art form to be a complete beginner at doing; I got sucked in by the meditation process that is supposed to go along with it. The whole idea is to be able to get oneself into a relaxed frame of mind and allow the Zentangle process allow one to focus and, ultimately, relax while the Zentangle sort of happens. Now, relaxation is supposed to stimulate creativity, and I guess the creativity stimulates release of tension. Frankly, although I have created some lovely designs as I learn the individual tangles, the completed piece–whether in my practice sketchbook or on a tile–looks (to me) like nothing more than a doodle, the stuff I used to draw in class or boring business meetings. And, although there are supposed to be something like 115 “genuine Zentangle” basic doodles, I have found not a single book that has them all. And I just don’t have the energy to search out all the sanctioned designs. And really. Why, authors of books X, Y, and Z, do you show me how to do variations on a theme if you are going to withhold more than half of the designs in the art form, and you are not writing another book??? Don’t you know I have no patience? Ah. That’s one of the points of this process, isn’t it? So what am I communicating with this? First, I am taking a stab at independence from the rigidity of following one book–well, maybe more than one (they all seem to follow the same methodology if not the same order of tangles)–to get me started. Second, I am communicating my lack of knowledge about combining colors that work well together. Maybe that is why they start you out with a black pen and a graphite pencil. The colors may be because I really want to practice with all the new toys at my disposal at once. Third, I am communicating that this art form has taught me more about shading and shadow than I can observe, read about, or guess on my own. It seems no matter how many workshops I attend or books on technique I read, shadow and shade became sensible when following authors’ instructions for shading the tangles. Needless to say, just as I keep practicing writing skills and oil painting and sketching skills, so I will also continue to learn and practice new Zentangle forms and stray from the structured path to do new (and hopefully better) doodles. After all, every new thing I learn applies to so many aspects of my life. And I am nothing if not a life-long learner. Will I ever learn the art of patience? Who knows. I am having fun! Write on! Or create on! 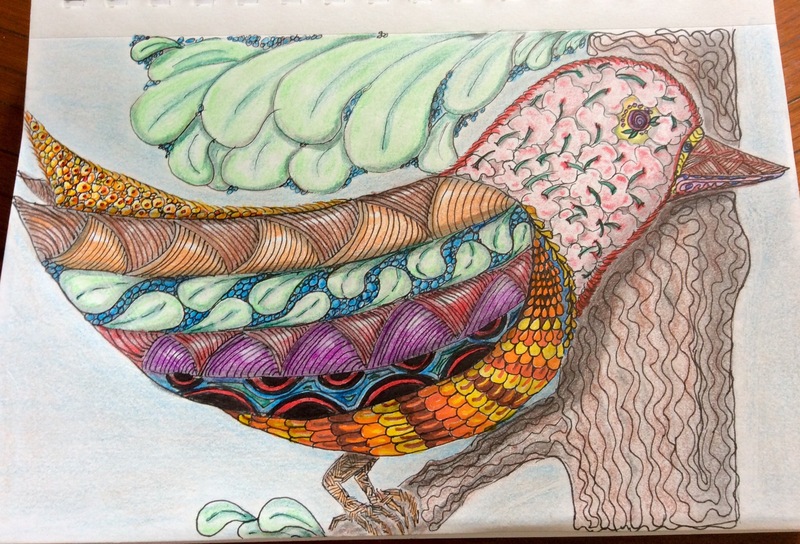 This entry was posted in About Writing, Creativity, improving my writing, Something New and tagged Art, doodles, meditation, new projects, new skills, patience, relaxation, Zentangle, Zentangle Inspired Art, ZIA. Bookmark the permalink. Its s nice you find time and patience to do all this. Actually I am not getting notifications to my mail of the posts of my fellow blogger friends, that’s why I have not come here since long time. Have you been receiving news of my posts, I want to know as many are not visiting me also. Shall come again to read other posts. I have been visiting almost no blogs because we are waiting to get adequate internet connection. I have not abandoned your blog. When we are connected, I will visit again. It is so nice have your reply. Finding time for other endeavours, really fine. I hope and wish you get internet access all the time.